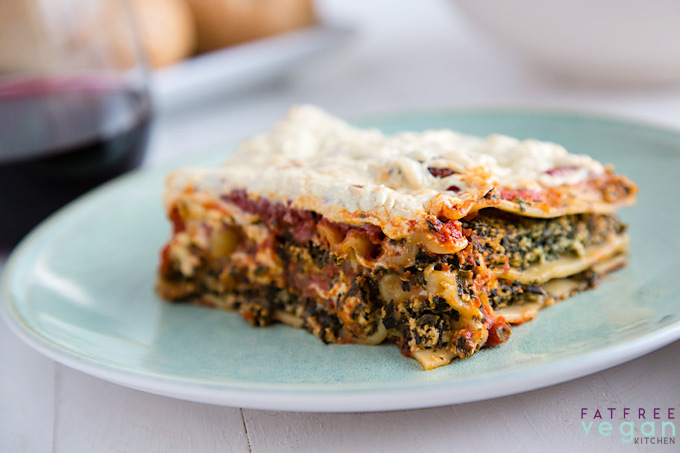 This is probably the easiest vegan lasagna you’ll ever make and one of the most delicious! No need to pre-cook the noodles – they soften as it bakes. Last night I had the pleasure of having dinner with a group of people taking a Civil Rights Tour through the South. The menu for the night was barbecued pork sandwiches and pork-and-beans, the idea being to give them a little taste of local cuisine (which revolves around pork, apparently). The only problem: Several of the 30 participants were vegetarian. When the planners of the dinner realized this, a call went out for vegan dishes, and I was happy to oblige with my potluck standard, vegan lasagna. 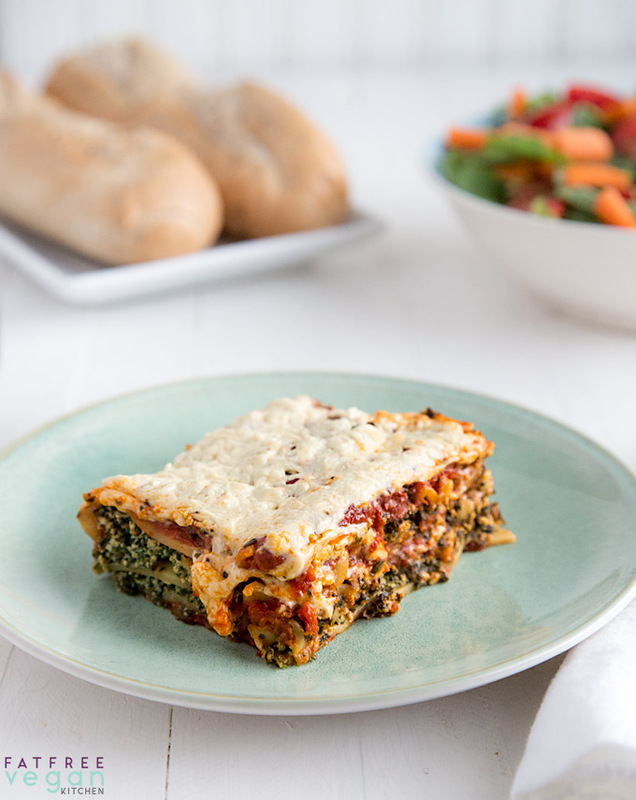 Recipes for vegan lasagna abound, and I’m sure you can find fancier, richer tasting versions, but for sheer easiness of preparation and basic yumminess, this one can’t be beat. You don’t need to pre-cook the lasagna noodles, and you can make it super-easy by using jarred spaghetti sauce. Check out just how easy it is in my short video. For some special occasions, I sprinkle the lasagna with vegan cheese during the last 5 minutes of cooking. This option is, of course, not fat-free, but it really helps “sell” it to any omnivores you happen to be feeding. But the plain, uncheesified lasagna seemed to be a hit at last night’s dinner. The pan returned home empty (and not just because E. ate 4 pieces!) I regret that I never got the opportunity to find out who the vegetarians in the group were, but it felt good just to know that they were there. 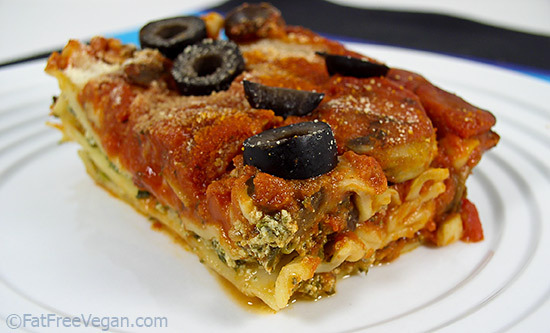 Using dry lasagna noodles eliminates the process of boiling the noodles and saves time. The extra sauce cooks into the noodles, making them more flavorful than boiled lasagna noodles. 1 pound firm or extra-firm tofu not silken! Sauté the mushrooms and garlic over medium heat in the 2 tbsp. water until tender; cover between stirring to keep them from drying out. Remove from heat and add the spaghetti sauce. Spread half of the sauce in the bottom of a 9×12-inch pan. Place a layer of noodles over the sauce, using three dry noodles and leaving a little space in between them. Spread half of the tofu mixture on the noodles (you can drop it by spoonfuls and then spread it or hold each noodle in the palm of your hand and spread the tofu on it before placing it in the pan). Cover with another layer of 3 noodles and then spread the remaining tofu mixture over them. Top with a final layer of noodles, and pour the remaining sauce over this. Cover the dish tightly with foil, and bake for 30 minutes. Then, remove the foil and bake for another 30 minutes. Remove from the oven and sprinkle with vegan Parmesan or cheese and sliced black olives if you want. The lasagna will cut better if you allow it to cool for 15 minutes before serving. Optional high-fat version: Sprinkle with a grated vegan cheese during the last 5 minutes of cooking. Calorie and fat content will vary depending on the brand you use. Weight Watchers, using a fat-free marinara and no cheese, this is 6 Freestyle points per serving. The nutritional data below is not exact and will depend on the particular ingredients used. This analysis was created using regular (not light) tofu and Barilla Tuscan Herb Pasta Sauce (with 70 calories and 2 grams of fat per 1/2 cup) and no optional ingredients except salt. Hi! 🙂 Just wanted to say thanks for this recipe – I found it too dry for my liking, but I adapted it by adding the white sauce from your polenta lasagne recipe and playing with some of the quantities, and I love the results. If you do ever want to adapüt the recipe: smoked tofu is very yummy in this. I love your blog! Thank you for all your inspiring recipes. This was the first vegan lasagna I made a few months ago and it was a winner! I used homemade marinara sauce and used the tofu ricotta recipe for VWAV with spinach added. I don’t know why I have not made it since! Since it was a favorite of my husband, I was hoping to make it for valentines day dinner. Can it be made/assembled the night before and baked the next day? Would there be any additional steps I would need to take? I assume it would need to be baked for slightly longer if it comes right out of the fridge. It does just fine when prepared the day before. Just be sure to either let it get to room temperature before putting it in the oven or let it preheat along with the oven. Happy Valentine’s Day! I don’t know how to add this to my recipe box. Please help! At the very top of the post, between the title and the share icons, there’s a line that says “Add to Recipe Box.” Click that. Thanks so much for a delicious recipe!!! Hi, This looks delicious! I will have to try it. I saw on here I believe the beet and garbanzo bean meatballs, but I am not finding them now. I have part of the ingredients, but I can’t find the recipe to complete it, lol. I love the recipes you share. I wonder if you can help me find it. Here’s the link: https://blog.fatfreevegan.com/2012/02/beetballs-a-vegan-gluten-free-soy-free-sausage-recipe.html. Hope you enjoy them! I made this yesterday for a group of (very omnivore) friends and just had to tell you how great it was! There were the usual jokes about still looking for the meat, but everyone enjoyed it and it was really very easy to put together. I used only one layer of whole wheat lasagne noodles and used sliced eggplant for the others. I didn’t have any vegan cheese for the top but it still had a good cheesy taste. Thank you for another great recipe Susan. If you pan fry the eggplant first, it doesn’t get to the state that some have commented on. The same might hold true for zucchini. I used to use Classico, but lately I’m using the Whole Foods brand because they have some that are oil-free and others that are organic. It is Wednesday, and I am going to make this again Saturday for my family. Love feeding the people I love blant based foods! Susan, I tried this on the recommendation of someone over in the FB McDougall group. I’m so glad I did! Throughout our dinner my husband & I kept exclaiming, “This is SO good!” Let’s just say there aren’t as many leftovers as I thought there’d be! I’m looking for recipes to serve for some upcoming, SAD-eating visitors. This is going to slay them. Thank you! I am wondering if the lasagna recipe freezes well? Yes, it freezes just fine. I wonder if the Lasagna freezes well? It freezes great! And it reheats easily in the microwave or oven. Keep it covered, though, so it doesn’t dry out. I had never even tasted a vegan dish before this week, but was inspired by a documentary I recently saw on Netflix. My daughter-in-law was planning to make her amazingly good meat-based lasagna and I decided to make your lasagna as well for immediate comparison. Everyone (all carnivores) really liked your recipe. My son even said yours was a “good alternative” to hers. I had sprinkled chopped flat leaf parsley as well as the sliced black olives on mine and it was MUCH more beautiful than hers. I will be making this again and am searching for other vegan recipes to try. Thanks!! I’m so happy to hear that! I hope you will find lots of vegan recipes that you enjoy just as much! I made this with a few substitutions to the ingredients in order to make it Tex-Mex style. I used half enchilada sauce and half tomato sauce instead of pasta sauce, and instead of the seasonings listed I used taco seasoning plus 2 tbs. of lemon juice in the tofu ricotta mixture. Aside from those changes, I followed the instructions exactly. This is only the second lasanga I’ve ever made, and last time I used oven-ready lasanga noodles. The difference was that my last lasagna was drier (I used a lot less sauce than this recipe) and the noodles were a little softer. I think I prefer a softer noodle than this recipe produced. It was a little chewy and gummy for my taste, and I think next time I’ll try partially cooking the noodles first, or maybe letting the whole lasagna set in the refrigerator for several hours. The tofu was very tasty and an excellent filling, but the amount could be increased. Anyway, I’m not a lasagna pro, but this recipe was pretty good. My omnivore boyfriend ate it and seemed to enjoy it. What substitute suggestions do you have for people allergic to mushrooms? You can either leave them out completely or substitute a vegetable you like such as zucchini or eggplant. I’ve made it with eggplant and it was delicious. I would add a little extra seasoning to help make up for the flavor of the mushrooms. I baked a mini-version of this tonight in my 3-quart Creuset so it would be a “one pot” meal. I cut the ingredient amounts to fit and broke the lasagna noodles into pieces since my Dutch oven is round. I did the tofu and spinach mashing first using the Creuset as a bowl (transferred to a plate), cooked the mushrooms/sauce in the pot on top of the stove, then instead of layers just kind of swirled everything into the sauce. Came out great! Thanks for such a versatile recipe! Wow, what a great idea! I’ll have to try it soon. It sounds perfect for just the two of us now. Wonderful. One meat eater, one fish eater, and one not sure, and me, a true plant based kind of guy. Everyone loved it as is. Used fresh spinach, doubled the mushrooms. It’s just easier and we love ‘shrooms. I cooked it on my gas fired BBQ grill. If you wish to try this way of cooking, give yourself some time to stabilize the temperature. I used two of four burners. Everyone thought I was crazy with the heat wave cooking lasagna, but I had the answer: cook outdoors. Thanks for the solid recipe. It was a true crowd pleaser. Made this today for our camping trip this weekend and had to make an extra tray to sample! I have to tell you, being Italian and having my mom’s recipe passed down to me, I never thought after going plant-based that I’d be able to find a recipe that came close, until today! Thank you so much for sharing this delicious recipe which I plan to make for Christmas for my Italian family to try! I had extra eggplant in my fridge, so I decided to add with the mushrooms! Wow! Thank you for your wonderful recipes! Every one I’ve tried comes out terrific. 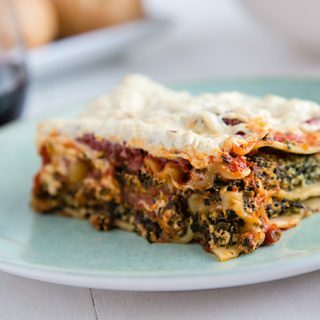 Am making the spinach and mushroom lasagna again this evening, and got to wondering if it can be assembled much ahead of time? I added my own preferences to your recipe: LOVE using fresh spinach, and I don’t really weigh it out, rather smash it all into the food processor till the tofu turns a pretty green, and I substitute miso for the salt — mmmm! The best product review? Three teen boys that devoured the lasagna without any complaints! I just want to thank you for this recipe. I have made it many times and it is always perfect. I use the filling recipe for other things too, like stuffed shells. Yours is my go to website for recipes, and I have never had one that didn’t turn out well and delicious. Thanks again! Thanks so much – Hugs! I’ve made this for pot lucks and it has always been popular. However I’m not a big fan of soy Parmesan so I always use either crushed cashew or simply nutritional yeast. Next time I’m going to make a huge amount of vegan bolognese in my slow cooker for this recipe. This is absolutely delicious exactly as written! My family and friends have enjoyed this recipe…and they are not whole-foods plant-based converts (yet) like my husband and me. Good job developing this easy to make and delicious fat-free casserole! I finally made this lasagna today after seeing it come across about three times over the years and knowing it was E’s favorite. Well it is my new go-to! I’ve always made Rip Esselstyn’s Raise the Roof but it is such an ordeal to make it, I rarely do. This is easier and absolutely yummy!! Will be adding it to the regular rotation. I did not made to tofu smooth; just crumbled it and mixed with the spinach. I accidentally put all the other filling ingredients in the sauce! But it worked so well still! I absolutely love this! Not fancy but I would serve it to company in a heartbeat! I’ve been eating this way for 8 months. Tonight, after being served your Easy Vegan Spinach and Mushroom Lasagna, my 16-year-old son said for the first time, “This is really good.” BIG praise from a young man mourning the absence of meat in the house. This one is definitely going into the rotation. And into my lunch tomorrow. Thank you, Susan! What is there to say? It’s a classic. I’ve tried four other vegan lasagna recipes and each one felt like something was “missing” and/or were ridiculously time consuming. This recipe is hands down the best. It’s easy, flavorful, and satisfying. My husband and I were really impressed. We happened to have a non-vegan family drop in for dinner and their kids’ favorite part was “the white and green stuff inside.” We will definitely be adding this to our regular meal rotation. I have made this dish several tines and it is amazing! It has become one of my favourite dinners. Thank you for this! This is my favorite lasagna too! It’s pretty much foolproof and always delicious! This is fabulous!! It tasted so rich we could not believe there was no eggs dairy or cheese. This is my new go to company dish. It was so easy. I used whole wheat lasagne noodles and Whole Foods fat free Marinera sauce. This was my first successful lasagne. Thank you so much!! We enjoy your recipes. Your Dirty Little Secret Soup and Black eye pea hummus are staples in our house. And your southern cornbread recipe from your dressing, etc…we love your recipes. Thank you for making our meals wonderful. We are grateful for the time you put in sharing your recipes. I constantly tell people to check out your recipes. I’m sorry for the dump question, but I want to be totally sure. You use dried pasta sheets, not the fresh pliable and uncooked version you can get at some places? So the water in the veggies and tofu is enough to cook them through? A little addition. For the tofu mixture, you just blend until all indegrients are incorporated? Not to a fully green paste, right? Yes, just use the regular, dry lasagna noodles found on the shelf with the spaghetti and other pasta. About the paste question, I would say mine does usually resemble a green paste. Once I had to make it without a food processor and just mashed it with a potato masher, and it was more crumbly but still good. Anther crowd pleaser! My omnivore husband loved it. It will be on the regular rotation at our house. Delicious and so easy! I served this for Christmas dinner and everyone loved it. The early birds even had it for breakfast the next morning. I doubled the recipe and made it in a large pan a few days ahead and then froze it (uncooked). After thawing in the fridge for a day, it cooked nicely in the oven. This is my new go-to lasagna recipe – thank you, Susan! Is there something I can use to replace tge mushrooms? This looks si yummy, but I hate mushrooms! You can skip the mushrooms entirely or add a vegetable that you do like. I recommend something mild-tasting like zucchini. Oh my gosh, I am officially a fan of this recipe! My family demolished it! Absolutely delicious!!! I brought it to my family reunion where no one else was vegan and everyone said how good it was! I didn’t save enough sauce to fully cover the top layer of noodles, so the top layer got kind of hard after baking. But when I reheated the lasagna (I made it a day ahead of the reunion), I made another batch of sauce and poured half on top. The top noodle layered softened right up after baking/reheating!! I was thinking about adding some veggie layers the next time I make it. I was thinking yellow squash, but what other veggies would complement the flavors in the sauce and filling? And should I layer the veggies raw or cook them first? I think that veggies like zucchini would be fine raw. You might also try some very thickly sliced eggplant. Always a family favourite! Easy and delicious! Loved this recipe!! Very easy to make and very tasty. Made it for part of my family’s Christmas meal. Everyone loved it, including the omnis. I didn’t add any vegan cheese or olives. Will definitely make it again (it’s my go-to lasagna recipe now). I have been wanting to make this recipe for years, yes years . Tonight I finally did, and am so very happy with the results, Susan! I was going to serve over arugula, but i forgot. Probably best i didn’t 🙂 Thx, so much Susan! I couldn’t give it a star rating for some reason… I give it a 5 ! 5 Stars! I just made this last night because I have company coming. I used rice lasagne noodles, Trader Joes Fat free spaghetti sauce (25 ounces each), and firm tofu. Everything was as easy as described and it is delicious! I can’t believe how the tofu/spinach spread gives me the same feeling as eating ricotta. I also used Chef AJ’s faux parmesan recipe on top. Thank you for sharing this secret recipe with me. I feel like I have something “normalish” to share with company that I will enjoy as well. And like you said it is very easy. It took me longer than 15 minutes prep, but everything does. My tofu was frozen, etc. Next time I will buy my mushrooms chopped and shave off a few more minutes. I think I will also prepare the seasonings a day ahead too.